Honor 20i Pre-orders to Begin on April 15 - Playfuldroid! Honor will be announcing the selfie-centric Honor 20i smartphone on April 17. The smartphone has been available for reservations in China since April 9. 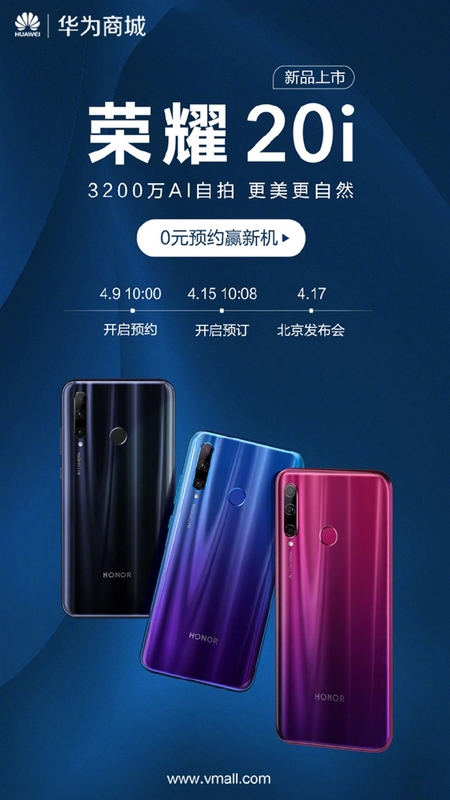 The Chinese firm has confirmed today that it will be carrying out the pre-orders of the Honor 20i from April 15 at 10:08 AM through Vmall and other leading online retailers in the country. 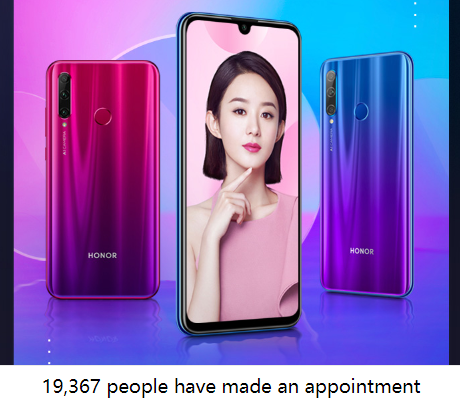 At the time of the writing nearly 19,400 people registered for the phone. The Honor 20i will be arriving in three colors like Black and gradient colors like Blue-Purple and Red-Purple. There is no information on the pricing of the phone. The Honor 20i has already bagged TENAA certification through which its entire specs have been revealed. The smartphone will be featuring a 6.21-inch IPS LCD display with waterdrop notch that offers full HD+ resolution. The Kirin 710 SoC will be fueling the smartphone. It will come with 4 GB / 6 GB of RAM. For storage, it will offer users with options like 64 GB and 128 GB. There will be a microSD card slot on the device. The EMUI based Android 9 Pie OS comes preinstalled on the device. The Honor 20i will be arriving with 24-megapixel + 8-megapixel + 2-megapixel triple cameras, but its USP will be its 32-megapixel selfie camera. It will include a 3,400mAh battery. On April 17, the Chinese manufacturer will be also announcing the Honor MagicBook 2 alongside the Honor 20i smartphone.